Just gave a presentation on the iPhone, the SDK and the Amazon Kindle with Gordon Snyder and Vince DiNoto. 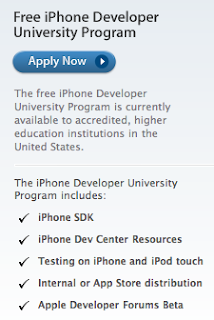 In the presentation, we discussed the recently announced iPhone Developer University Program. If you teach programming or your college teaches programming this is a great opportunity to become part of a program that I think will really get kids excited about about software development. The news below regarding demand for iPhone programmers doesn't hurt either! oDesk, a firm that specializes in outsourcing freelance programmers to companies that require programming work to be done reports that demand for iPhone programmers has surged by 500% from March 2008 to September 2008. Here's one of our favorites - Guy Kawasaki - posting a slideshare presentation detailing 10 Ways to Use LinkedIn. Not only a great example of Guy's presentation style, but also a great introduction to LinkedIn - a social networking site every professional should be involved in. Apologies for the quality of the video and the audio. This is a presentation titled "How to Become a Thought Leader for $0" by Paul Gillin, author of "The New Influencers: A Marketer's Guide to the New Social Media." I was not right up front and only started streaming the presentation about 15 minutes in. I was stream the video live, there is about a 30 second lag. I used my MacBook with built-in iSight camera and a Sprint broadband card for the Internet connection. With dwindling travel budget, I think tools like this are going to become increasingly important - with very little additional cost, you can stream your classroom content, speakers, conferences, meeetings - just about any live event. We'll we refining this approach with better cameras, better microphones and better preparation. Stay tuned! How Do You Keep Up With All This Stuff? The title of this post is a question I get asked all the time. Not only at my college, but at presentations I've given around the country. This is a screenshot from Google Reader's Trends feature. As you can see, I subscribe to 170 blogs and have read over 10,000 items in the last 30 days. I've learned how to go through these 10,000 items very quickly - starring stories that are interesting and worth coming back to later; sharing items with with other Google Reader users that are "friends" or "followers;" and finally emailing stories to real friends that are not Google Reader users. This is somewhat of a follow up to my earlier "Do you feel overwhelmed ... " post. Are you the person in your organization who is always thinking outside the box? Coming up with ideas that are ahead of their time? It's a difficult and often lonely position to be, but take heart, because there are more of us out here than you might imagine. There are a number of tools for capturing and streaming live content to the web. UStream TV.com is just one of many. Here is some video I captured of David Armano at a conference capturing the content using his 17" MacBook Pro. David is VP of Experience Design at Critical Mass - a marketing firm that is really pioneering the use of social networking tools and new digital media. As I say in the audio narration, with dwindling travel budgets and increasingly sophisticated students, we need to begin looking at these tools for professional development, outreach, and even live streaming our classroom lectures. I'll follow up later with some links for other similar tools. Image of SlideShareOne of my favorite Web2.0 sites slideshare.net has added a great new feature. It was already possible to upload a presentation and share it with someone by embedding the presentation in a blog, website or even a course management system, such as Blackboard or at our college ANGEL. A new feature allows one to create a presentation 'pack' using a group of related presentations and share or embed the entire set (pack). I see all sort of applications for this, such as a way of sharing content with conference attendees, sharing your lectures with your students or creating an embedded review tool for a text or exam. I'm a member of the slideshare group - Effective Presentations - here is a pack created from all of the presentations members have shared with the group. The result - in one simple space, I can share a wealth of expertise and opinions on how to make more effective presentations. So whether you're organizing a conference, presenting at a conference or teaching a class, give slideshare and their presentation packs a shot - I know you'll be hooked. by the bureaucracy in your organization? Don't get discouraged - you're not alone! 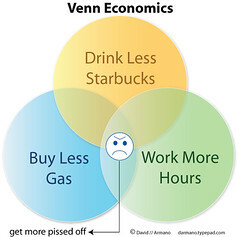 Here's a great use of the Venn diagram - from David Armano - that describes today's economic situation so perfectly. Anyone who reads this blog knows how much I love innovative approaches to presenting information - particularly complicated, technical information. 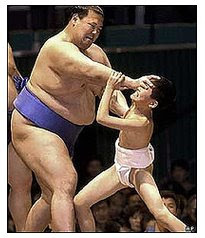 Garr Reynolds at Presentation Zen posts a great video explaining CDOs or collateralized debt obligations - which are among the investment instruments that are partially to blame for our current financial crisis. Marketplace Senior Editor Paddy Hirsch uses a whiteboard and a marker to explain CDOs in 6 minutes. If you teach economics or business, this is a great way to begin a discussion of our current mortgage crisis. The smartest thing about Sprint's no-contract service plans is the Pick 2 plan, which enables customers to use the service as both a home Internet access service and a mobile broadband service. Subscribers lock in two devices, such as a modem and laptop card, for $50 per month. This should help alleviate the frustration surrounding poor coverage and a lack of a nationwide footprint on the mobile side as subscribers will still see the value in being able to plug in a self-provisioning modem and surf the Web from home with localized mobile broadband access. I suspect, however, that the Home plan might be the biggest hit early on. The pricing, at $25 per month initially and $35 thereafter, is competitive with existing DSL and cable offerings. And the main advantage is the fact that the Zyxel modem Sprint offers is a self-provisioning modem, meaning subscribers plug in the modem and activate service via the Web. DSL and cable service can be activated the same way but often require a truck roll. Moreover, the Xohm service can be canceled at any time. Home plan: Designed as a wireline broadband alternative that includes a self-provisioning Zyxel modem for $80 that plugs into any WiFi router. The plan is $25 per month for the first six months and $35 thereafter. On-the-Go plan: Designed as a competitor to existing mobile broadband. Devices include laptop cards, USB modems and the Nokia N810 tablet. Promotional pricing is $30 and $45 after six months. Daily-on-the-Go plan: Targets pay-per-use WiFi customers at $10 per day. Pick 2 plan: The most interesting pricing plan that allows customers to use the service as a home Internet access service and a mobile broadband service. Subscribers lock in two devices, such as a modem and laptop card, for $50 per month. 3G Not Fast Enough? What About 4G/WiMax? If you've been watching WiMax developments the last couple of years, you might be interested in the following webinar. showing students how to login to and naviagate your online course. The following video is from Techsmith, the makers of Camtasia Studio and Jingproject. Jingproject is free to download and use and allows you to create and share videos of up to 5 minutes in length. If you want to explore screencasting, Jing is a great place to start. As you get comfortable with screencasting and find you want to do more, consider tools such as Camtasia Studio, which you can download and try as a free trial and purchase at a reasonable price with the academic discount. So without further adeiu, here's a quick introduction to screencasting from Techsmith, called Screencating 101. Here's a story on some tests of a Sprint WiMax deployment in Baltimore, Maryland. Very intriguing results. Click on the link to watch video from the test. Image via Wikipedia Here's a great video from fora.tv. The Long Now Foundation presents co-founding editor of "Wired" magazine and author of "Out of Control" Kevin Kelly giving a history of scientific methodology and sharing thoughts on the future of science.